I’ve been thinking lately about how to make this Christmas extra special and dreamy because I love Christmas and also, we're hosting family Christmas lunch at our place this year. So I’ve been looking north for inspiration, to the home of Santa Claus no less. After all, the Scandinavians are known to celebrate Christmas wholeheartedly. In Australia we grow up sending Christmas cards illustrated with snow and reindeer, ideas of sitting around a fireplace followed with hearty Christmas lunch and pudding. Try as we might, this doesn’t work for our climate. Over the years in Australia we have found a beautiful balance of the Nordic traditions that suit our southern hemisphere summer. Let’s embrace the best of both old and new traditions. A fresh bunch of pine adds an instant Christmas vibe. Dot with Danish decorations available at The Apartment. This is not the time for a minimalist approach (to be honest some of those bland minimalist Chirstmas decorations zap all of the fun out of Christmas), however we still need to be considered and thoughtful about our selections. Here are some tips on creating some Christmas hygge at your place this year. Light up a load of candles and then light some more. Arrange a cluster of candles on a tray on the kitchen bench, a few on the dining table and even in the powder room. Line up a few glass votives with a tea light flickering on the windowsill. The Scandinavians light real candles on their Christmas tree and keep a bucket of water nearby, just in case. Do not try this at home folks. The Danes are the worlds highest consumers of candles, burning through about 6 kilograms per person every year. So trust them to design truly beautiful candleholders, the Antipode range by Menu can be arranged in an artful display and look stunning with, or without candles. I’m drawn to scented candles with familiar Australian botanical scents, which is why I love the Bondi collection from The Apartment. Candles don’t need to be scented or expensive to get that cosy festive effect. If the idea of burning candles on a fire ban day doesn’t appeal, then use battery operated LED candles. West Elm have some great LED candle options that don’t look tacky. The Carrie lamp is dimmable and gives those hygge feels whilst being an invaluable addition to the beach picnic as dusk falls as its completely portable. Not a surface shall be without a candle to ensure full Christmas hygge. The Antipode candle holders by Menu make a gorgeous effortless display. Alongside the Troll vase that delivers elegance in any setting. 1. Antipode Candle Holder $188. 2. Bondi 2: Giant Fern Candle $69. 3. POV Circle Tealight Candleholder by Note Design Studio. $155. 4. Carrie Lamp $349. 5. Glass Votive. $37. 6. Radius Candleholder small $59.95. 7. Ribb Candle holders set of 2 $32.50. According to the Swedish tourist board’s website, “Many Swedes believe—mistakenly—that their legal right of access to the countryside allows them to fetch a tree from the woods wherever they like, with an axe, a bucksaw or, as in western Värmland, with a shotgun.” Blasting away at your Christmas tree sounds a bit dramatic, a trip to your local nursery is a safer option. I grew up with a best friend that owned a Christmas tree farm, so we walked through the farm to find that spot where all of the ‘good trees’ grew so to me, there’s nothing like a real tree. If you can’t bother with the hassle of a real tree, then a fresh green wreath is a great option to bring some of that glorious pine smell into the house. Hang a wreath on the front door to show the neighbours that when it comes to Christmas festivities, you mean business. Swap out the mirror over the fireplace with a fresh green wreath and add lots of cascading greenery over the mantle. I used the POV tealight holder by Menu from The Apartment to wrap some pine branches around and it’s the perfect minimalist Scandinavian solution. And all year round the danish designed POV is a stunning alternative to artwork. Alternatively, wire wreath frames are available at craft stores and Martha Stewart can show you how. I wrapped a fresh bunch of pine around the POV for the easiest wreath ever. Scatter a few Danish decorations on the mantle, Light up those candles and be merry. A fresh wreath makes a beautiful centerpiece on the dining table, surrounded with (LED) candles flickering inside a glass votive. Visit your local florist or nursery for pine tree branches, eucalyptus branches, deep green branches (often used as fillers in a bouquet), bunches of holly or the quintessential Christmas plant, poinsettia. A simple pine branch placed on the mantle piece or laid across centre of the table does a lot of the festive heavy lifting. Add a string of delicate Christmas lights (Adairs have some) among the pine and you’re done. Hanging a fresh pine branch is a simple and contemporary way to add some Christmas cheer at home, especially if a tree is too much commitment or you’re tight in space. We’ve hung one over the mantle, but there are so many opportunities to do this around the home. 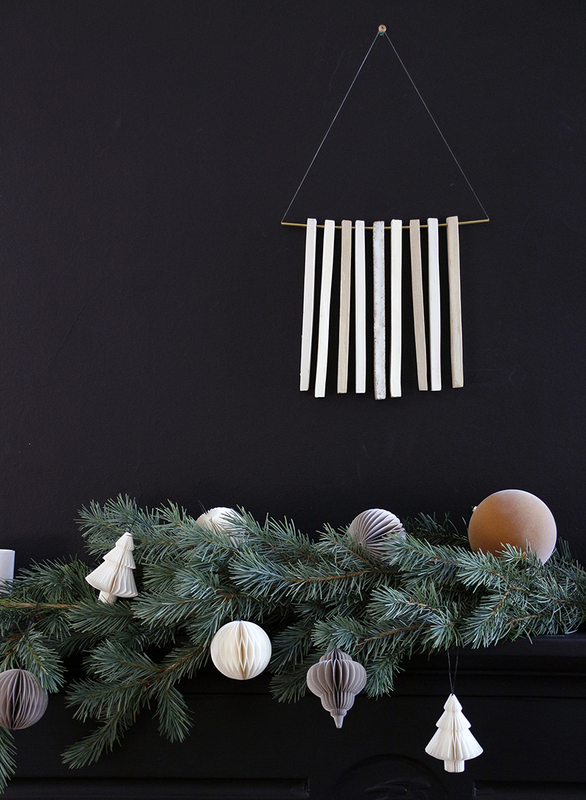 A simple pine branch is a contemporary way to bring some Christmas cheer into the home. Dot with delightful Danish decorations. If you prefer one to keep rather than a fresh one, go for a faux wreath or branches that are natural as possible without the glitter. The Woodsfolk have a realistic wreath with pine cones and Adairs have a nice one too. Decorate the window sills with fresh pine branches and slip on a few green cushion covers. These gorgeous patterned botanical linen cushion covers by Peaches & Keen have a metallic gold piping which makes them the perfect festive addition at Christmas and all year round. 1. Phold silicone container Medium Green $74.00. 2. Danish Decoration 4 pack $58.00. 3. Art Mobile by Peaches & Keen $450.00. 5. Hammered mini brass bowl $39.00. 6. Tomte Charcoal from The Woodsfolk $3.95. 7. Moonlight Begonia Linen Cushion Cover $99.00. 8. Eagle Owl framed poster by Teemu Jarvi $345. Norweigians don’t hesitate to to start the Christmas decorations at home, starting in the last week of November. So if you’re serious about this - get started! Use the colour green to bring in the festive vibes. Green has a relaxing effect and Christmas is the perfect time to bring in as much green into the home as you can (let’s face it, sometimes Christmas can be a busy time and we need to take a moment to relax). Apart from adding green foliage in the home, think of opportunities to mix things up by adding green accents around the home. Place a little green container like the silicone Phold by the front door filled with chocolates to delight visitors as they leave. Sip on a few green cushion covers over your cushions and a gorgeous table runner on the table and we’re getting close. Add green throughout the house by adding green hand towel in the guest bathroom with a sprig of pine branches and a candle. Not forgetting the bedroom with some fresh green bedlinen especially for the festive season. Rather than pairing green with the traditional red, try terracotta or peach. The Bottle Grinders in Hunting Green/ beige are a subtle way to add a touch of green, and of course they are gorgeous all year round. The time is now folks, and I mean right NOW. Today. The Scandinavians may be known to keep to themselves a bit, however when it comes to Christmas they love sending Christmas cards to their neighbours. Don’t let the tradition of sending Christmas cards die! Get online and order yours now, here are some tips. For a twist on the traditional, go to Bespoke Letterpress. The folk designs of angels woven into an intricate floral design are sure to take pride of place on the mantlepiece. They’re crafted using authentic letterpress techniques with gold foil in Bowral which makes them even more special. For something to appeal to the child in all of us, Hello Miss May have some irresistibly cute cards. I prefer to shop in an actual store (showing my age, I know) so try your local bookstore. Mine is Avoca Hill on Toorak Road and they have a great range by Rifle Paper & Co. The designs contemporary and beautiful and I don’t need an excuse to visit that divine bookstore. Also My Bookshop is a great place for cards. I’m a fan of paperless post for digital cards and invitations. They employ amazing designers so if I’m in a hurry and know that getting to the post office won’t happen, it’s a great option. Whatever you do, avoid buying dull generic Christmas cards from a petrol station. Decorate the house with cute woodland animal figures. H&M have a playful range of kitchen wares with an animal motif that are a lovely conversation starter at the Christmas table. I prefer the more traditional animal woodland animals like owls, foxes and squirrel, however this isn’t really about what I like and if the kids want a Christmas turtle, then so be it. Swap out an artwork for a subtle festive feels, I love this charming illustration of an owl by Finnish artist Teemu Jarvi, which is available at The Apartment. Of course, there should be reindeer however the Swedes prefer a goat. The Yule Goat has its origins in pagan tradition and more recently the goat is known as a mischievous, rowdy figure, sometimes demanding gifts and sometimes receiving them. I like these cute animal figures around the house as they are playful and only make a special appearance once a year. I’m all for stylish Christmas decorations, but sometimes something that just makes me smile in enough. Don’t forget to leave something for Santa! Keep a chic serving board on hand when visitors drop by, or take along to a picnic and load with delicious cheese. A Travel cup is ESSENTIAL for coffee loving Melbournians and you can’t get more Melbourne than a handmade ceramic one! The perfect Kris Kringle gift. Now is the time to bring out all of those special things we only use for special occasions. Using brass tongs to serve Vaniliekage (Vanilla Christmas Cookies) will make you feel like the hostess with the mostess, trust me. Keep a gorgeous jug on the bench filled with ice water with sliced orange and a scrape of a vanilla bean. Keep a milk jug (like this versatile Speckle Jug from The Apartment) and an impressive tea pot to brew some aromatic Christmas tea effortlessly when entertaining visitors. Since we are spending so much time baking delicious gingerbread houses and Christmas cinnamon buns, we should definitely decorate the kitchen too. Of course we already have candles in the kitchen, but don’t forget little touches like the Christmas kitchen towel (Adairs have some nice ones). 1. Speckle Jug $39. 2. Brass Tongs. $32. 3. Animal Teaspoons $14.95. 4. Tab Teapot $49.00 5. Bottle Grinder $140 . 6. Salt Dish by Adele Macer Ceramics $25.00. 7. Paddle Board $69.00. 8. Black Ceramic Jug Adele Macer Ceramics $60.00. 9. Drip Bowl by Ella Bendrups $38.00. Keep some gorgeous kitchenware on hand for unexpected visitors and fill a jug with a festive ice water with orange slices and a scrape of vanilla bean accompanied with a ceramic bowl filled with chocolate coated nuts. Or if wine is more your thing, you will surely convince your guests of your expertise in wine when using a wine breather. 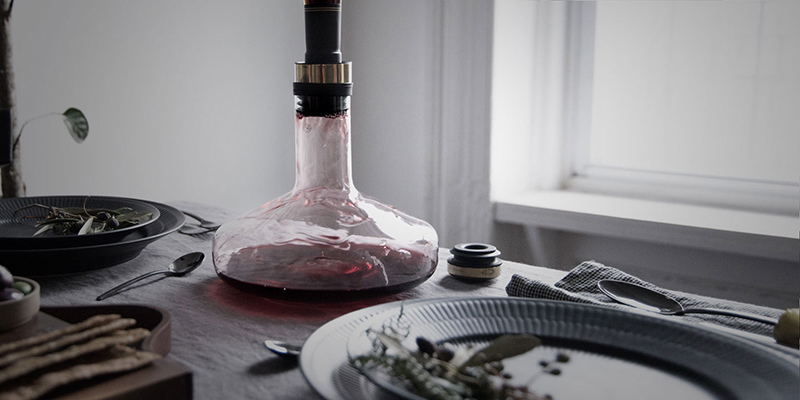 The Deluxe Wine Breather by Menu is a stunning addition to the Christmas dining table. The Menu deluxe wine breather is sure to impress at the Christmas table. The Tomte (Swedish), Tonttu (Finnish) or Nisse (Danish) is a mythical creature known in Nordic folklore, like a goblin or brownie. My grandfather was Finnish and he described them so well that as a child I was 80% sure I saw one. The Woodsfolk have a range of adorable Tomte that I’m going to hide all over my place for the kids to find. Gather your Christmas decorations for the home, get some gingerbread cooking going in the oven with Christmas songs playing in the background and get busy. Setting up the tree and adding special touches around the house is one of my favorite things to. For a minute there, everything is perfect. Merry Christmas from Lauren & Phil.